Cookie Recipe: Chocolate and Almond Chunk Crunchy Cookies. This is a very basic but “grown-up” version of a chocolate chip cookie recipe. It has quality chunky chocolate chips, almond nut pieces and all embedded into a crunchy oat biscuit. This really is a tea time treat. It’s very easy to bake, takes less than half an hour and will no doubt take much less time for you to eat! 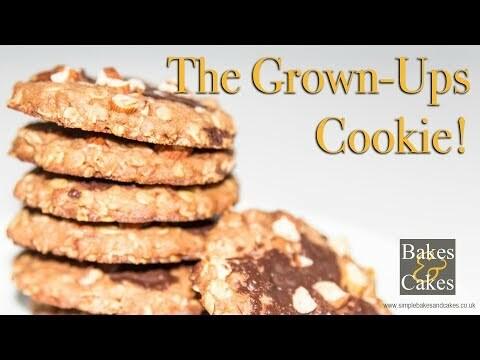 Depending on your chosen size of cutter this cookie recipe will create around sixteen chocolate chip and almond crunchy cookies, which is just enough to share, albeit with a small group of friends!! Pre-heat your oven to 170 degrees centigrade and lightly grease 2 baking trays with a flavourless oil. 1.Melt the butter, Demerara sugar and Golden syrup in a heavy based pan over a very low heat. After 2 or 3 minutes when it has all dissolved take it off the heat. Chop the chocolate and almonds into small pieces less than 5mm each. In a large mixing bowl sift the flour and salt together then add the porridge oats and mix thoroughly. Add half the chocolate and nuts and mix again. Pour in the buttery mixture and mix. Scrape onto a worktop and press flat. Using a 6cm cutter, press down and cut out as many biscuits as possible – usually about 16. Sprinkle the rest of the almonds and choc chunks onto the biscuits and lightly press into the top. Bake in the centre of your oven for roughly 12 to 15 minutes. Do not let the edges burn. Once baked take them out of the oven and leave to cool for 10 minutes before turning them out onto a wire rack to cool completely. If you have to store them, place them into an air tight container. Chances are though, if you are like me, you’ll eat them straight away! So enjoy them as quickly as you can. This cookie recipe originally started as a Delia Smith recipe from her book “Delia’s How to Cook; Book One”. For a list of 10 favourite diabetic cookie recipes click here. Now, challenge yourself to bake a more adventurous dessert like my basic cheesecake recipe. Go on, give it a try! Or, if you like chocolate, have go at my homemade brownies recipe. Let me know how you get on and please SHARE this recipe with friends and family by clicking the social buttons below.